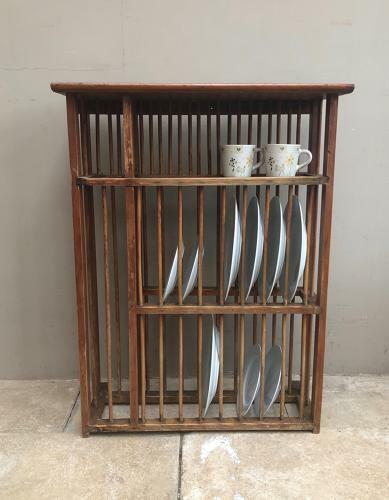 Early 20th Century Pine Plate Rack. Great piece which holds 18 modern size dinner plates (many antique plate racks dont hold modern size plates) this one does, or or course put side plates on too. It has the benefit of a slatted top shelf which holds stacked saucers and cups and the top can be used as a shelf (some are open). It will push against a wall and can be used on a worktop but perfect wall hung. Collection or Courier. UK £45.